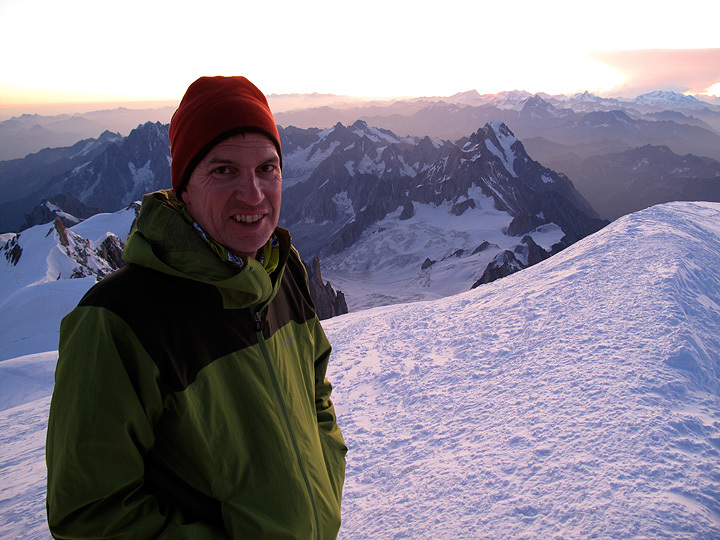 John Hornbaker, who's most recent residency claim is San Francisco, joined Mark for 6 days in (mostly) the Mont Blanc Massif. 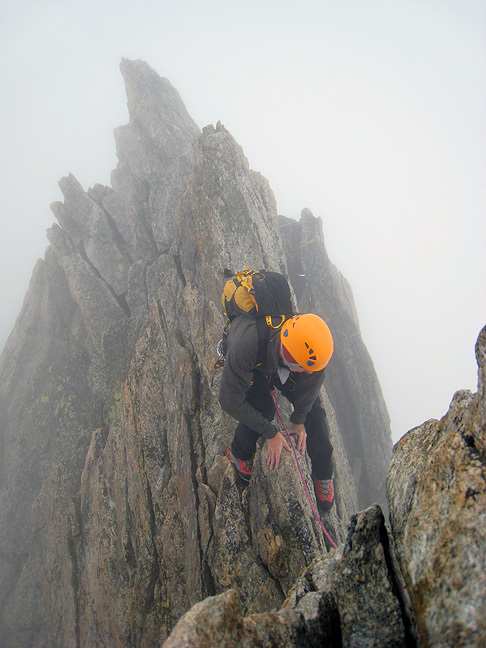 Other than our first rather moist day, we enjoyed some superb climbing conditions, certainly some of the best of the summer. 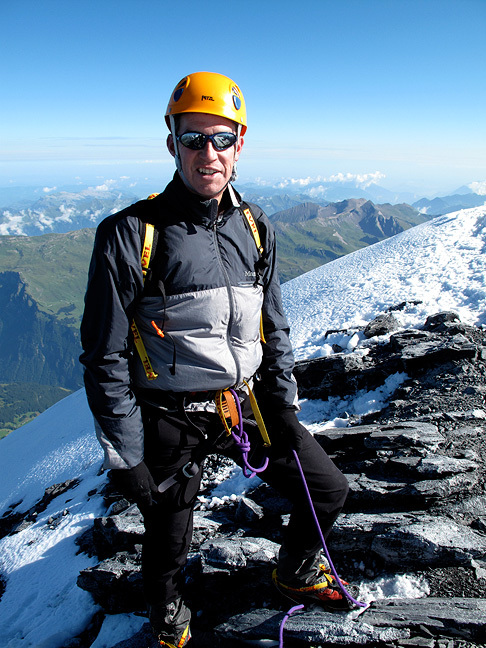 Our original plan was to stay near Chamonix, but with good conditions on the Eiger (not such a common thing) we decided to give that a try. Our first day was decidedly cloudy. 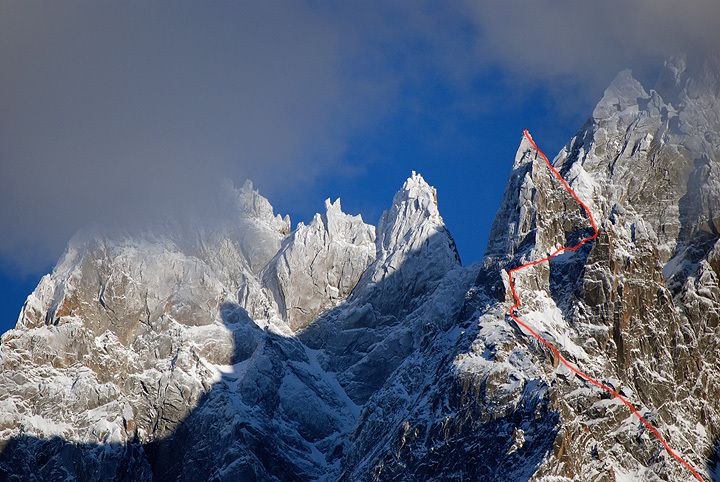 Our original hope was to do the Salluard Route on the NW Face of the Aiguille d'Entrèves. However, in the persistent fog it was simply too hard to find! (I had never done this route before). So we opted for the Traverse instead - probably a good thing as light snow started to fall just as we finished. Here, John enjoys a short "à cheval" section of the route. The evening after our Entrèves traverse it rained quite hard. 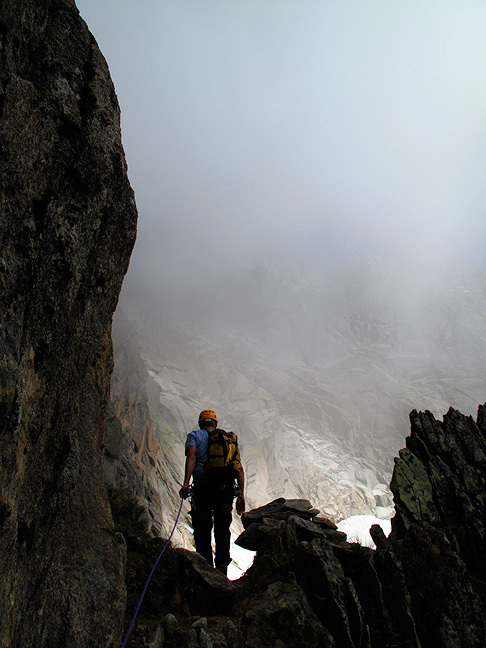 However, an improving forecast suggested that the rock on the Aiguille du Peigne might be just dry enough for an ascent. 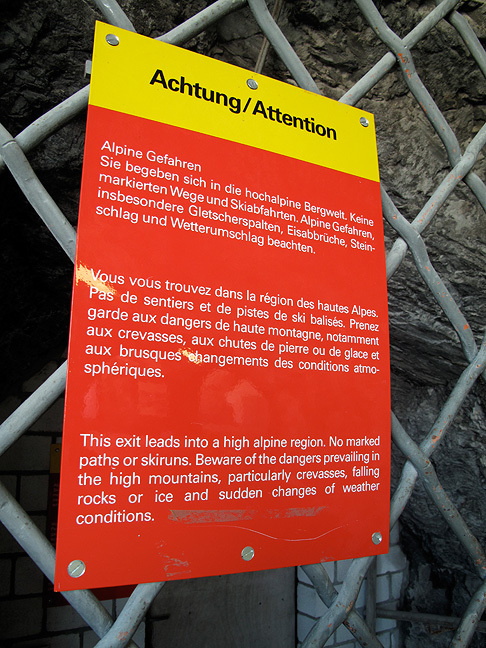 We chose the Eperon Minettes, finishing with the normal route. On the Eperon section the rock was just barely dry, but up higher was sun-warmed and wonderful. This photo was taken in late November of 2008. I simply did not have one of more recent vintage which showed the peak. 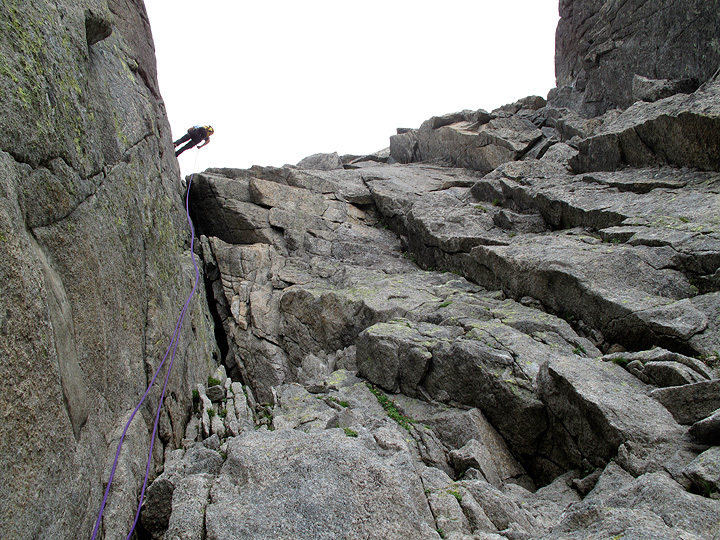 John on the final steep pitch before we reach the crest. 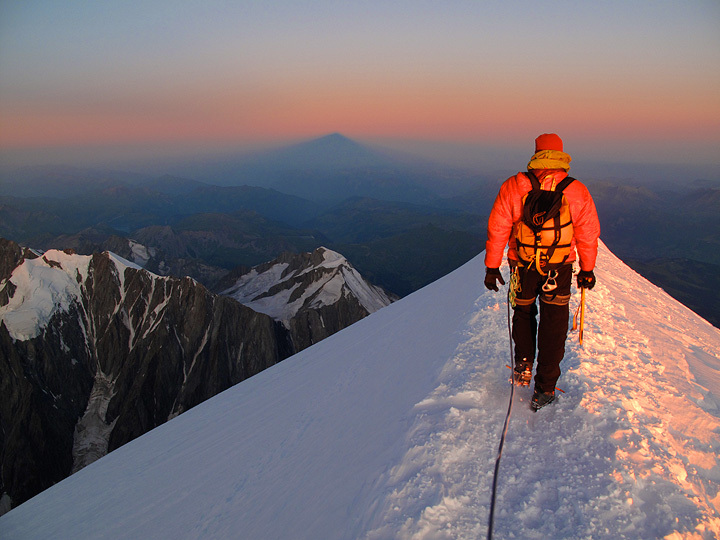 Above we have a few short moves, then an airy traverse to the summit. 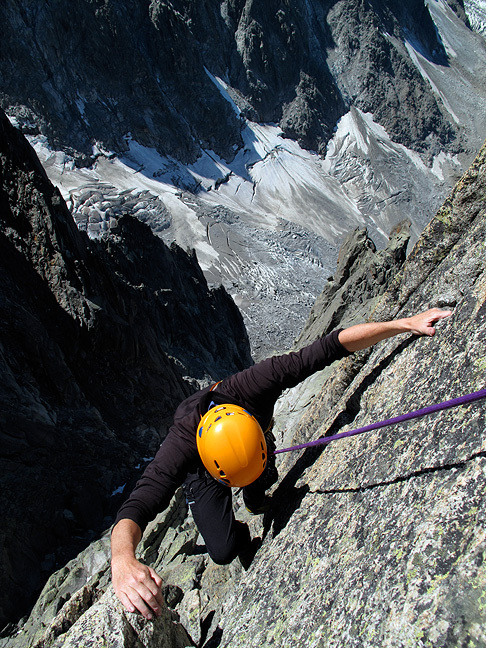 Rappelling back down into the Papillons Couloir. And a short hike back to the end of the difficulties. 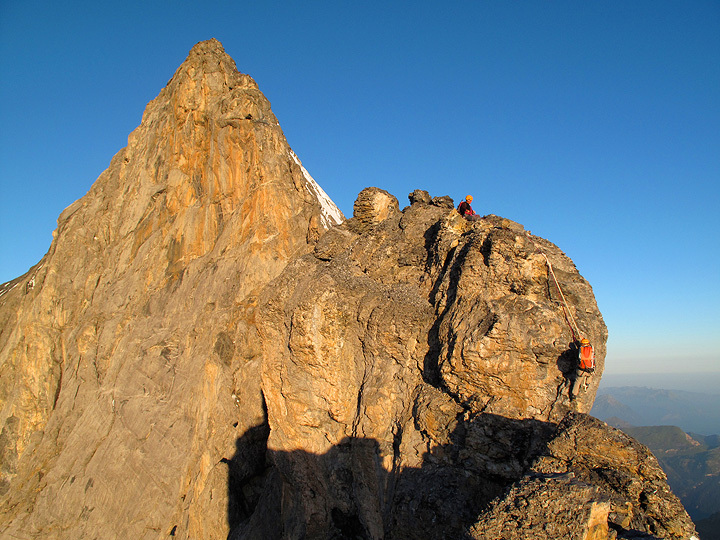 With a great weather forecast, we decided to go for the Mittellegi Ridge of the Eiger. 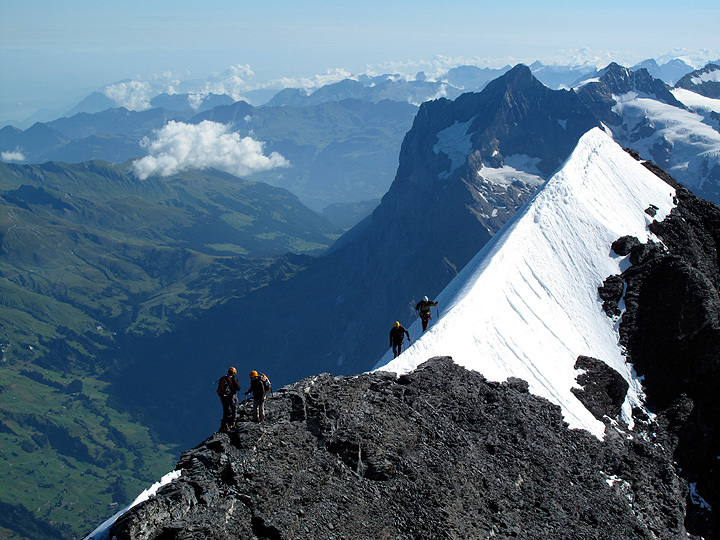 The climb starts with the Jungfraujoch railway, taken as far as the Eismeer station. 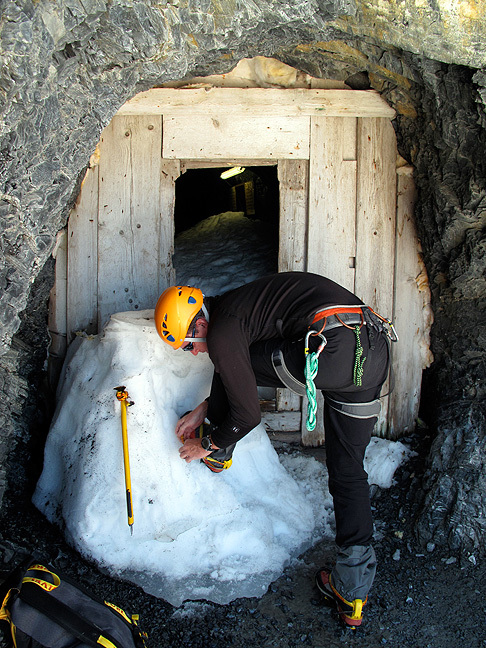 A "secret" door marks the start of an icy tunnel and the exit onto the glacier below. 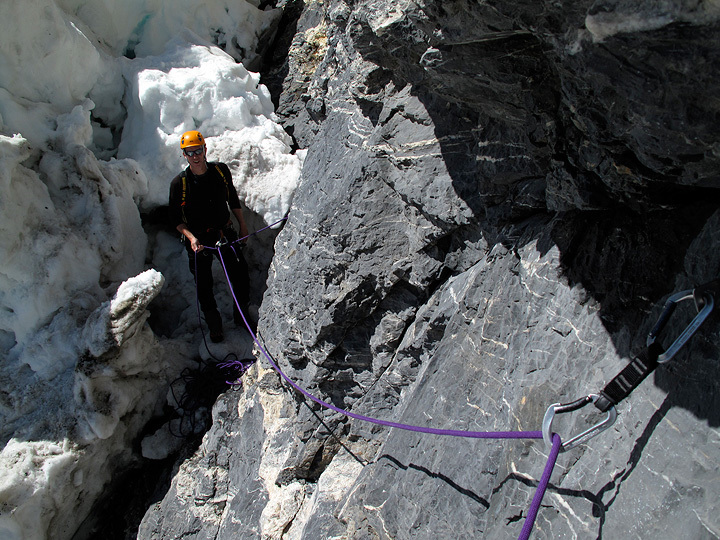 Roping up for the glacier crossing on the way to the hut. 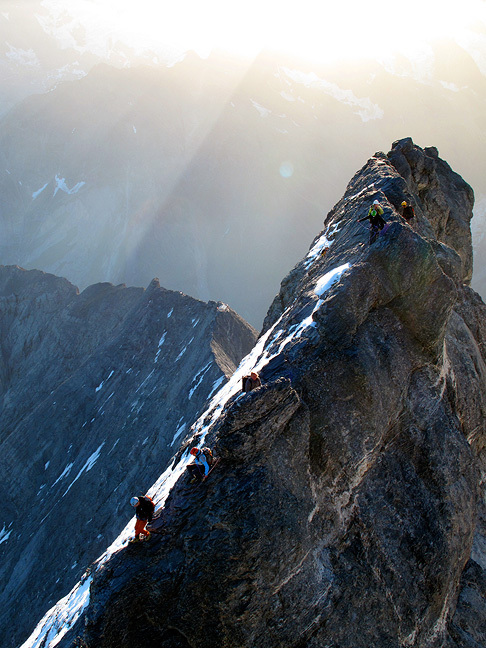 Another party heads for the start or the rock climbing, and then to the hut. An amusing departure from the ice, and the start of the "sport route" leading to the traverse ledge above. 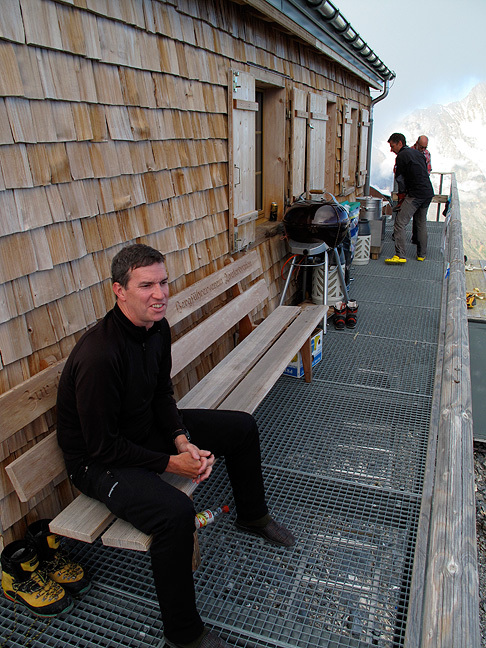 John takes a moment to enjoy the view, as well as the hut-supplied slippers! 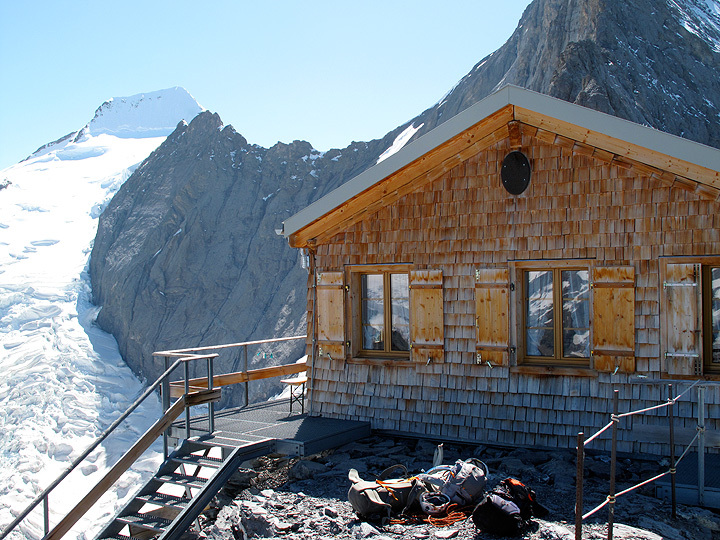 The Eiger, seen from the Mittellegi hut. The following morning begins in the pre-dawn darkness. 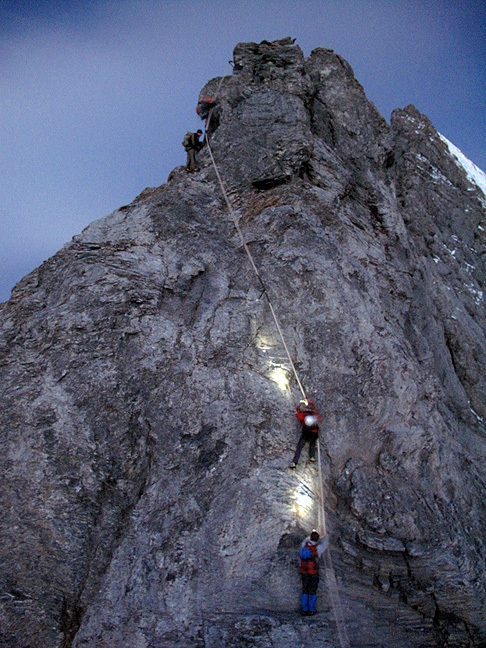 A group ahead of us tackling the first section of fixed rope. 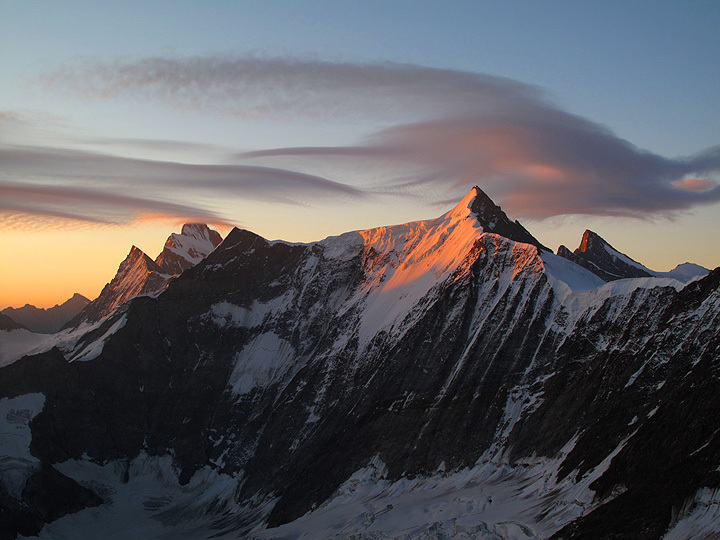 Sunrise reveals lenticular clouds over the Fiescherhorns and the Finsteraarhorn. 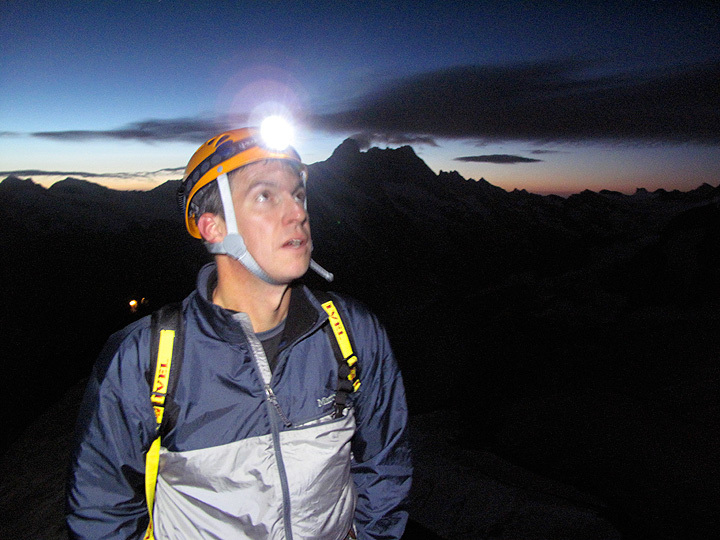 It is nice to be able to turn off the headlamp and see what is all around. The view back down towards the hut. 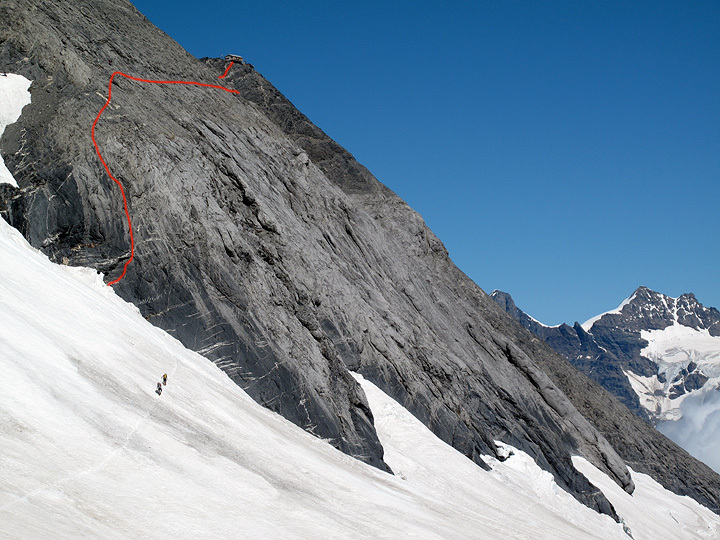 The route is quite exposed for much of its length. 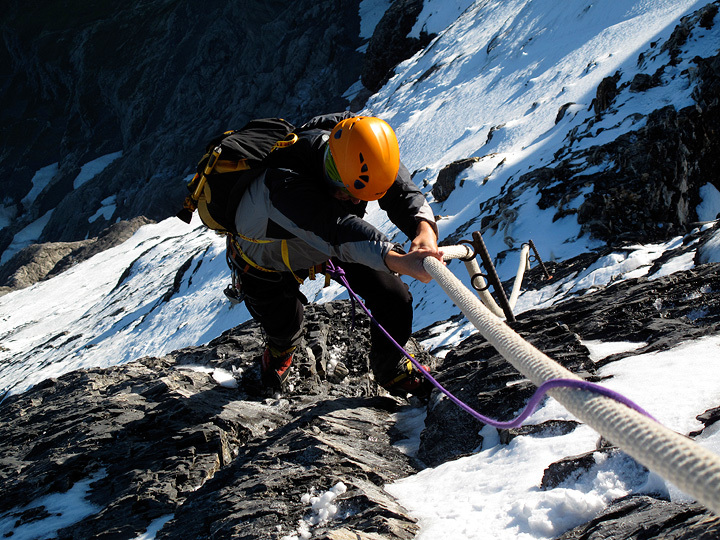 There are several section of fixed rope, otherwise the climb would be quite difficult indeed. As it is, it seemed plenty hard. 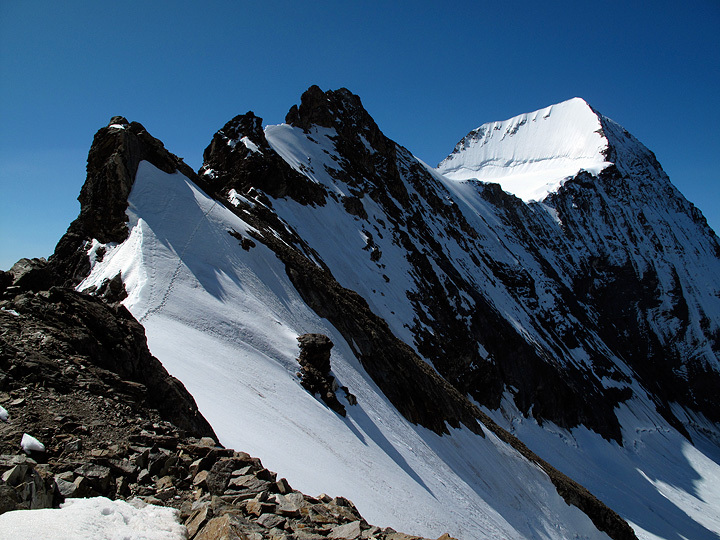 Just below the summit the rock gives way to snow, with some decidedly airy traverses above the North Face. Grindelwald lies far down in the valley below. 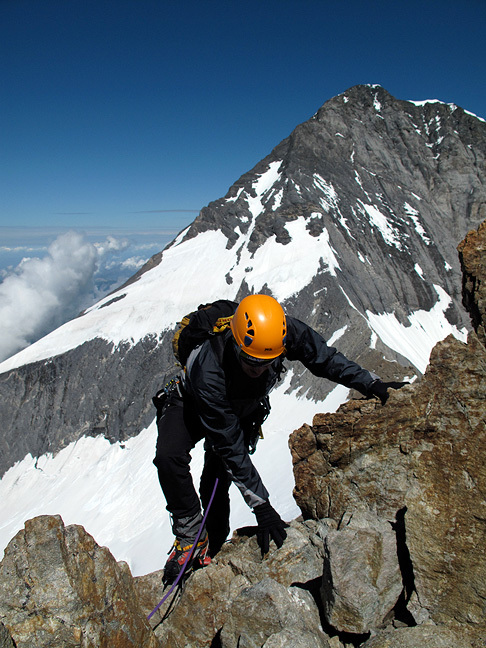 The preferred descent is usually via the South Ridge, a long and complicated affair, usually taking longer than the ascent itself. 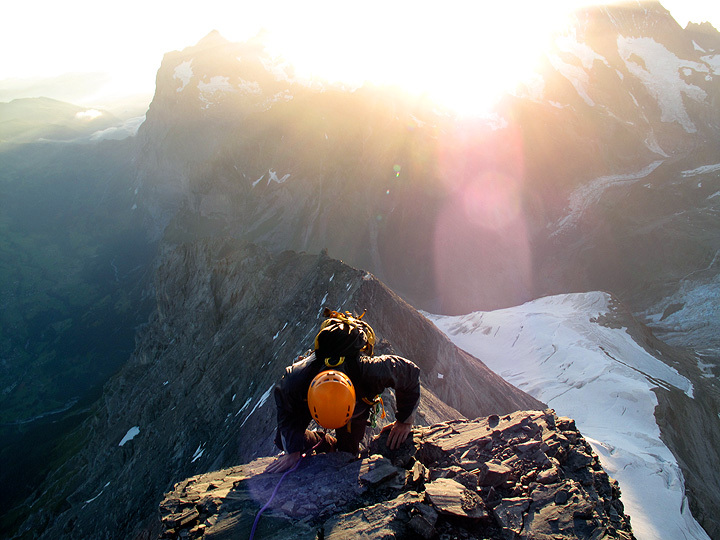 In this photo we are looking toward the Mönch, and the towers over which we'll need to climb. 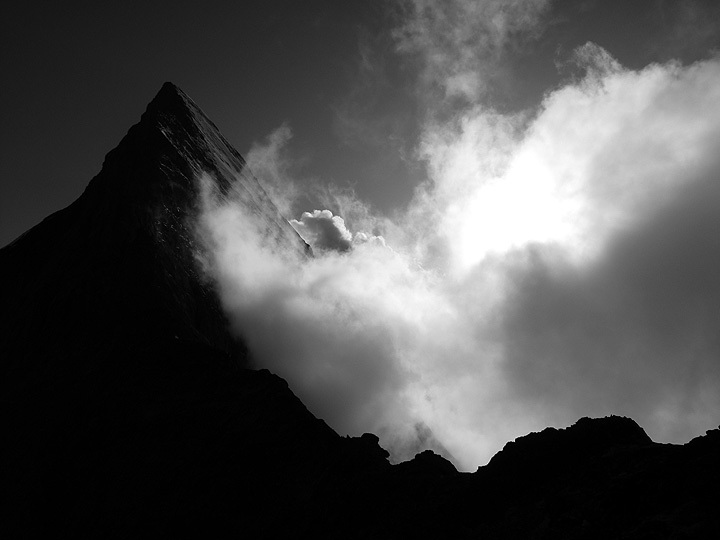 The view back towards the Eiger from somewhere among the towers in the previous pic. It was a long day, though we did manage to get down, and even drive back to Chamonix (some 3 hours distant), in time for dinner. 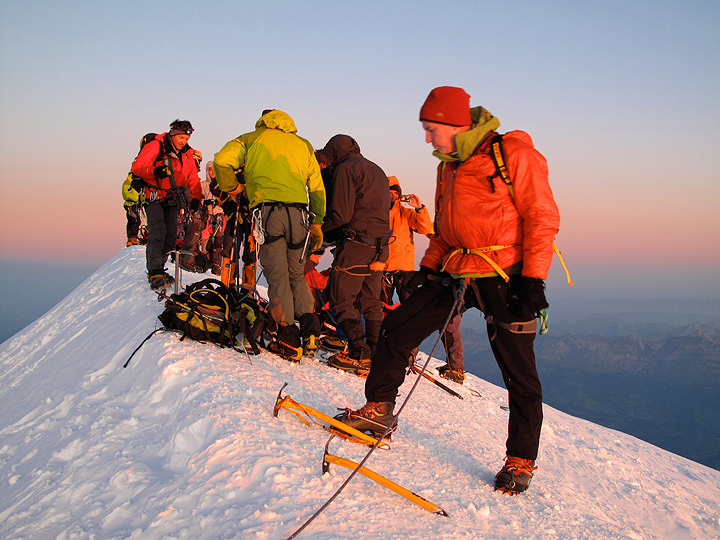 For our last climb, we chose the Traverse of Mont Blanc. 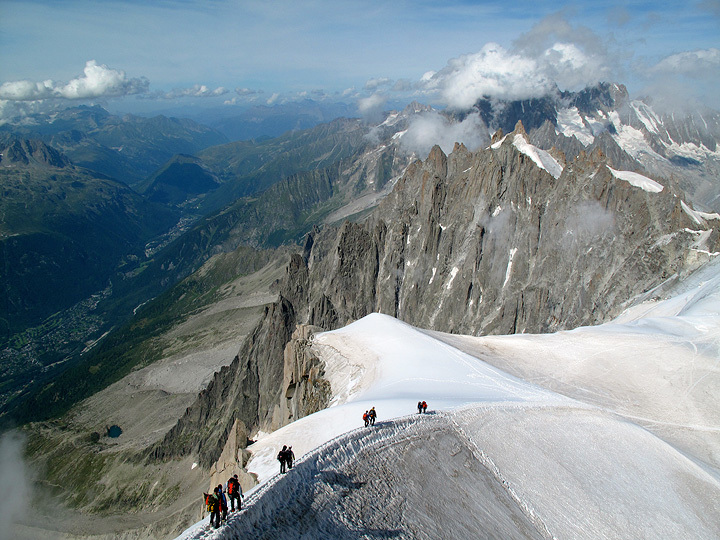 With a very leisurely start (and a bit of a beak afer the Eiger) we take a late-afternoon cable car up the Aiguille du Midi, and finish with a short, 30 minute walk to the Cosmiques hut. With breakfast at 1 am I don't have many photos of the early part of the climb. 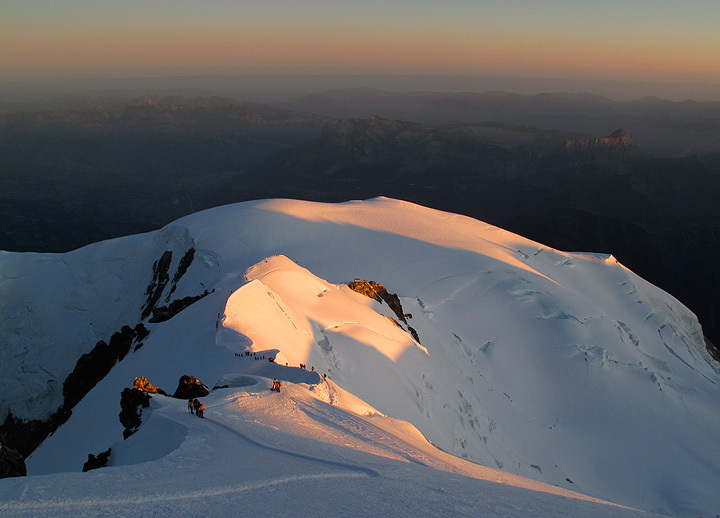 In fact, we moved so quickly we arrived on the summit just before sunrise, some 4 hours and 40 minutes after leaving the hut. 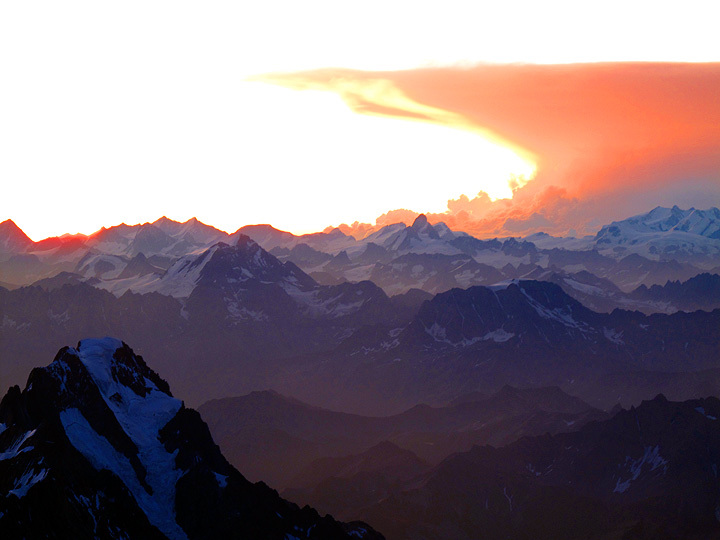 This shot was taken from Mont Blanc's summit looking east towards the Matterhorn and a huge thunderhead brewing over Switzerland's Engadine area. John on the summit. We waited ten minutes or so for the sun to come up. And it is time to start down. 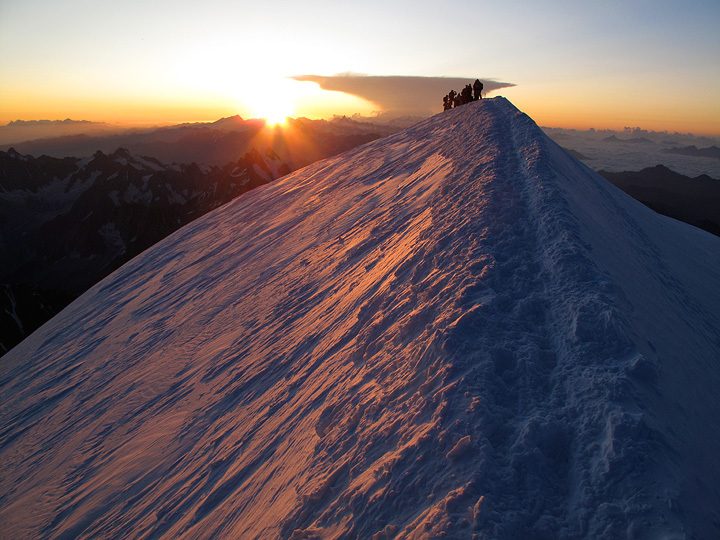 You can see the shadow on Mont Blanc in the distance. One last look back towards the top. ...and on down the Bosses ridge. 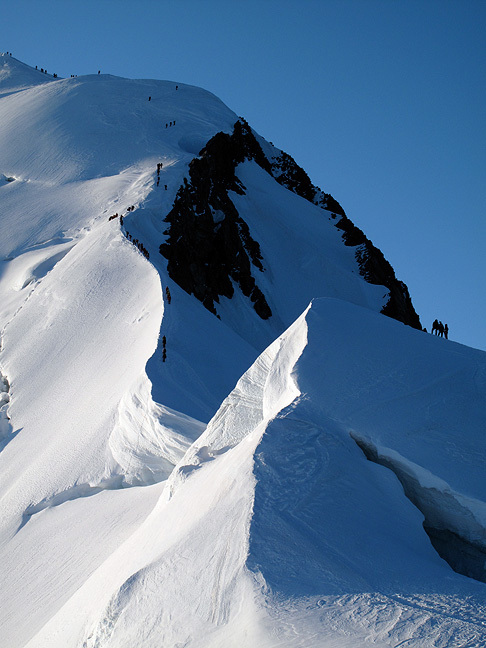 A last glance back up the Bosses ridge of Mont Blanc.